"Role of technology in achieving the imperative of maximization and optimization"
Maximization and optimization techniques help field service organizations to solve fundamental service problems. They provide an imperative way of making business decisions, focused on achieving the highest outcome in a cost effective manner. Companies operating in the service ecosystem attempt to achieve this outcome by adhering to the principles of maximization and optimization. What is service ecosystem and what is its role in field service organization? The service ecosystem refers to the complex array of business functions and transactions involved in the delivery of field service to end-customers. Field service organizations include a service ecosystem which dispatches field technicians with the right parts and skills to deliver services in a timely manner. 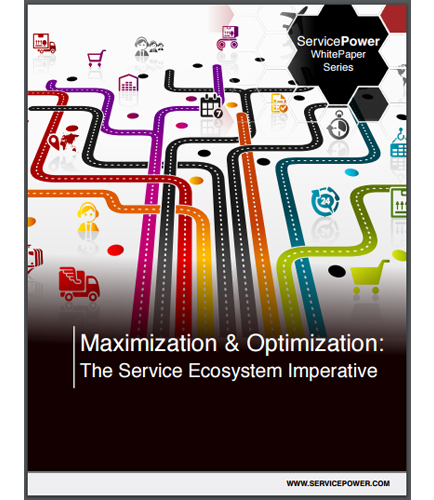 Download this whitepaper and learn more about solving field service problems faced by field service organizations and how ServicePower, an expert in providing Optimization Technology has come up with an innovative way of mobilizing field service management to improve productivity and efficiency.